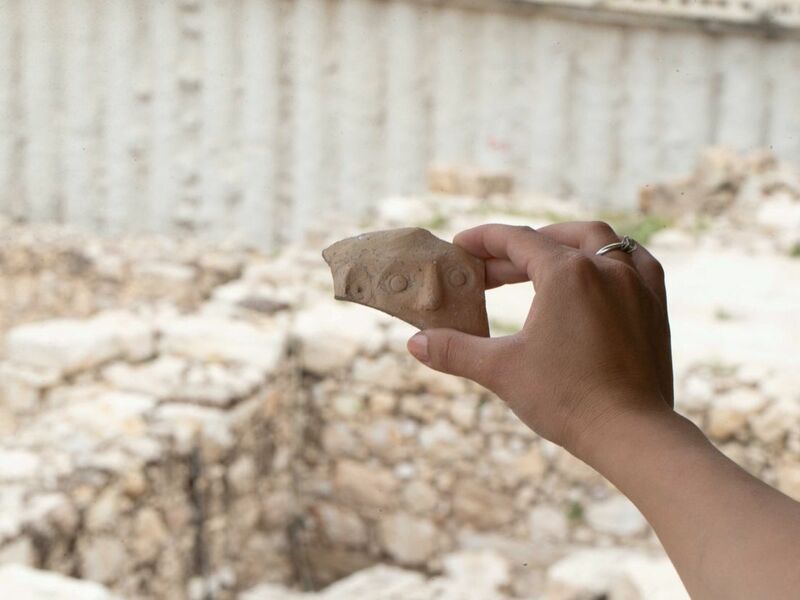 A fragment of pottery found in the City of David excavation, beneath the site formerly known as the Givati parking lot, shows that the ancient Egyptian predilection for the grotesque godling Bes had reached Jerusalem, at least once. 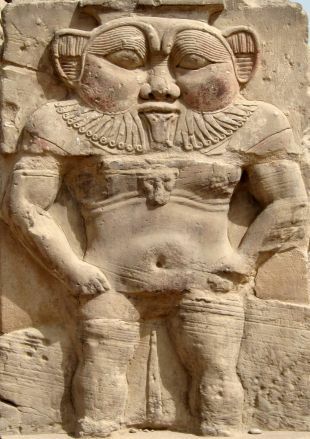 No other images of Bes, whose strange cult began in the earliest Egyptian kingdoms, has ever been found anywhere in the Judean Hills, say the archaeologists from the Israel Antiquities Authority and Tel Aviv University. His was not a visage that would have launched a thousand ships. The piece found in Jerusalem retains only the apotropaic godlet’s goggling eyes, an ear and part of the mouth, but is typical of his rather repulsive depiction – yet if anything, Bes’ face was not designed to awe or frighten, but to amuse. As in, laughter is the antidote to evil. The image of Bes – decorating vessels, worn on pendants or otherwise – was less a religious artifact and more like a “hamsa” hand-of-god amulet common today throughout the Middle East. Or like a rope of garlic, hung in the home to ward off evil, Vilf explains. While the Bes fragment found in Jerusalem dates to the Persian period around 2,400 to 2,500 years ago, i.e. the 4th and 5th century B.C.E., there is no reason to think the Persians brought him there. The sherd was found in the garbage pit of a household. Very likely it had graced a pot that broke back then and was thrown out. “That’s a reasonable assumption, because we didn’t find other parts of the vessel,” IAA archaeologist Yiftah Shalev tells Haaretz. They have no other information about the household itself – whether it might have been Jewish or otherwise. 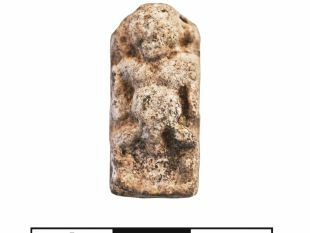 We may speculate that the home wasn’t Jewish, because if the Israelites had a weakness for this deformed dwarf deity 2,500 years ago, it hasn’t been found in the excavations of their homes – while other figurines have. The Jews of yore were not always the strictest monotheists. Bes himself arose from the dimmest reaches of recorded history in North Africa: His images are associated with the earliest Egyptian kingdoms. Even then he seems to have been one of the minor members of the pantheon, Shalev explains – but always played a protective role of sorts, that expanded over the centuries. 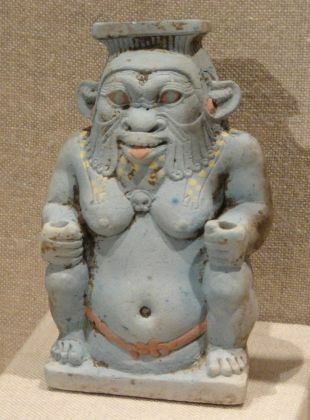 At first the bearded dwarf figurine was responsible for the home and family cell, mainly protecting pregnant women, women in labor and babies and infants. Over time he evolved into a generic protector of good against evil. Among his eventual roles was patron of music, which is thought to gladden the heart and drive away evil, Shalev explains. Throughout, his visage was grotesque: A dwarf with a small face, bulging eyes and a long beard, his tongue stuck out and he was often wearing a feathered cap. As we would call it today – he looked clownish. “It is believed the image was designed to make people happy, again driving away evil forces,” Shalev says. In a way, Bes could be said to have represented not a single minor deity, but a whole group of deified dwarves. In any case, from its apparent point of origin in the Nilotic kingdoms, the cult gradually spread throughout the Levant, becoming especially popular in Persian and among the Phoenicians who settled on the Mediterranean coast. Possibly, the image has also been found in the famous ancient Israelite site of Kuntillet Ajrud in the Sinai. Some think the rock art there depicts YHWH and his wife, Asherah. Some pooh-pooh that postulation and suspect the crude picture shows Bes. Yet others think the theory that the crude drawing of a god shows Bes is insane – why would an Israelite site hail the minor Egyptian deity. 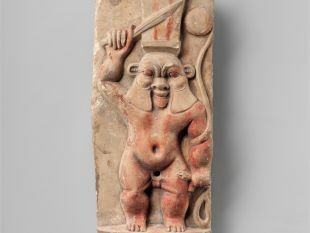 The character of Bes filtering down to us through the ages may have influenced religious behavior around the Mediterranean, culminating in cults such as Pan the goatish god and Bacchus. The ancient civilizations were in contact, whether in battle or in trade, it is not unthinkable that their "gods" became part of the cultural exchanges. Persia for instance seems to have imported the Bes cult over the years from Egypt, possibly by Egyptian artists coming to work, or Persian soldiers returning home, Shalev suggests. And come their day, the Phoenicians found Bes charming. It is possible, even reasonable to think, that it came from Jaffa or some other Phoenician town that traded with Jerusalem. “Huge quantities of amulets with Bes’ image have been found along the Israeli coast,” Shalev says, such as the port of Tel Dor and Tel Meborach in the north, and in towns along the southern coast too. Quite possibly doting parents from North Africa to the farthest corners of the Levant lovingly placed Bes amulets hung on strings around the necks of their roistering children, who might then mischievously stick out their tongues, in emulation of their divine protector.